United States Sociology: A Career? Other notable people who majored or made a career in sociology include: The Reverend Martin Luther King Jr.; W. E. B. Du Bois; Georg Simmel, Alex de Tocqueville, Jorgen Habermas; Amati Etzioni; Ronald Reagan; Robin Williams and Dan Aykroyd; Anthony Giddens; and First Lady, Michelle Obama. Most people who take sociology take only 1 course (that's estimated to be 600,000 US students per year). But more and more are choosing it as a major. 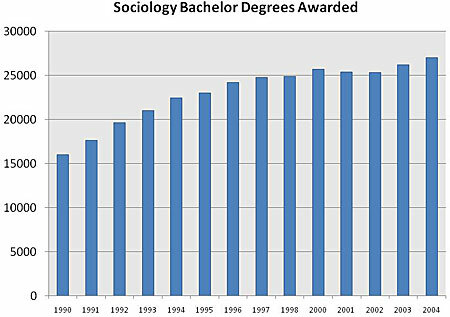 The next 3 figures, Figures 3, 4, and 5 show the numbers of sociology graduates from 1990 to 2004 at the Bachelor's, Master's and Doctoral level. In Figure 3 you can see that over 20,000 students graduate each year with a sociology Bachelor's degree. Many of them find work in government, social service, business, and other service-related sectors of the economy. 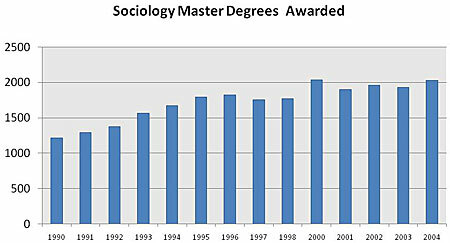 Figure 4 shows that about 2,000 graduates earn their Master's degree in sociology each year. 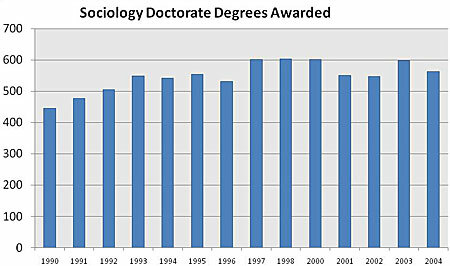 And in Figure 4 you can see that about 550 students graduate each year with their Doctorate in sociology. Of course the career with a doctorate pays the best, has the best career advancement opportunities, and is the most comprehensive training for research and theory that a student could acquire. *U.S. Department of Education, National Center of Education Statistics , Integrated Postsecondary Education Data System,1990-2004 ( Washington, DC: NCES, 2006). www.caspar.nsf.gov. Retrieved 12 October 2008. Best Jobs in America). This report also ranked college professors as the 2nd best job in America. Over half full-time doctoral-level sociologists are faculty at colleges and universities (www.asanet.org ). If I'm right, you probably won't major in sociology and you likely just needed the 3 credits of social science elective. I admire you for being in higher education. I urge you to graduate with your four-year degree. This course and textbook will enhance your thinking, science, and writing skills and make you an overall better student. Enjoy it. Ask questions of your professor. Participate in the classroom discussion. If you do choose sociology as a major, then look me up at your next sociological conference meetings.